The most comprehensive and compelling research on this topic was done by two Harvard Business School professors, John Kotter and James Heskett. They conducted four years of research, in which they looked at 11 years of business results across more than 200 companies spanning 22 different industries. They reported their learnings in their seminal book, Corporate Culture and Performance. 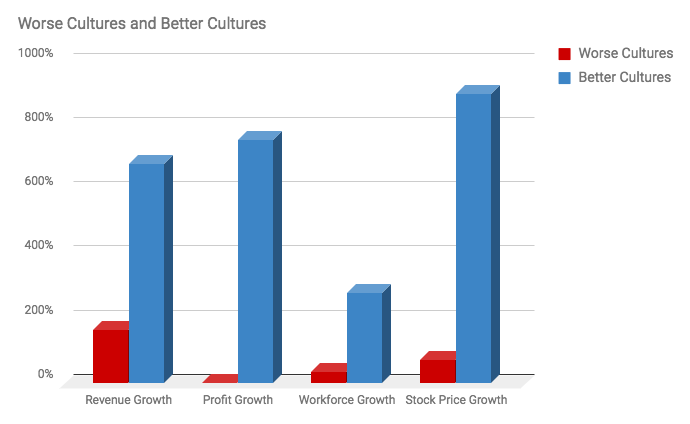 What they found was that companies with better cultures dramatically outperformed the rest. Leading Business School Professors from The University of Minnesota, the London Business School, University of Cambridge, and the University of Southern California collaborated in research to identify the key drivers of successful innovation in successful companies. They looked at 759 businesses across 17 countries and found that company culture is the single biggest factor in the success of innovation companies.